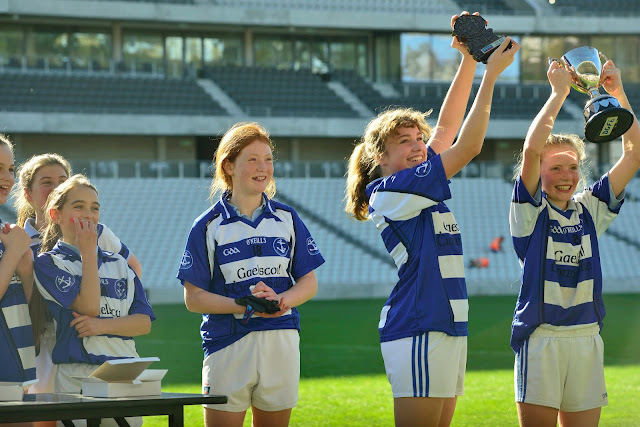 Táimid ana bhródúil as ár bhfoireann cailíní Sciath na Scol a bhuaigh an chraobh in aghaidh Baile na Daibhche. Bhí an-lá ag gach éinne a d'fhreastal ar an gcluiche. Is féidir libh na grianghraif a fheiscint má leanann sibh an nasc seo. Ár mbuíochas le Múinteoirí Selina, Aodán agus Alex a rinne an treanáil i ndiaidh am scoile leo. Congratulations to our Sciath na Scol girls football team who won their final, beating Ballinadee NS in what was a wonderful school occasion in Páirc Uí Chaoimh. We had great support at the match and great memories were made. You can view some photos by following this link. Our thanks to Múinteoirí Selina, Aodán and Alex who did after-school football training with them.